Cologne Cathedral is a Roman Catholic church in Cologne, Germany, one of the magnificent accent structure in Germany. There is this beautiful Hohenzollern Bridge. The bridge was constructed between 1907 and 1911 after the old bridge, the Cathedral Bridge (Dombrücke), was demolished. 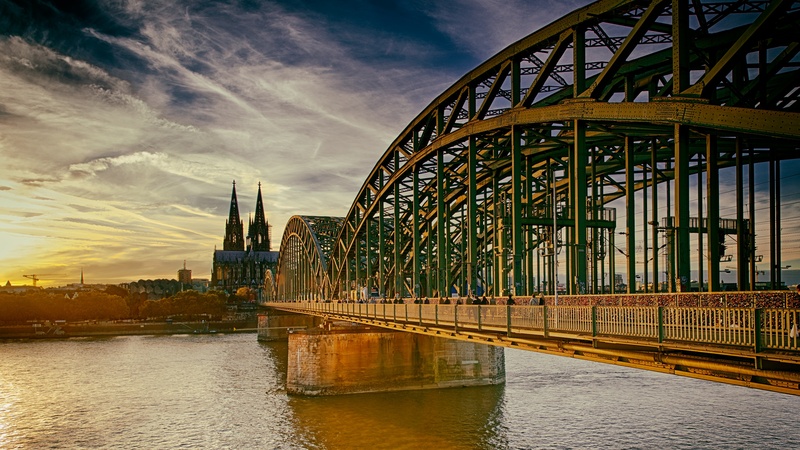 The Cathedral Bridge was unable to handle the increasing traffic in Cologne. It was named after the House of Hohenzollern. The Hohenzollern Bridge was one of the most important bridges in Germany during World War II; even under consistent daily airstrikes the bridge was not badly damaged. On 6 March 1945, German military engineers blew up the bridge when Allied troops began their assault on Cologne. After the war, reconstruction was quickly organized; by 8 May 1948, the Hohenzollern Bridge was accessible by pedestrians again. Over the next eleven years the bridge was improved until by 1959 it was usable without any impairment. During the 1980s, the bridge was renovated with two new tracks. The Hohenzollern Bridge now regularly has over 1200 trains pass through daily. The bridge is regarded as an important part of Cologne as it connects Cologne’s central station with major European cities on the other side of the Rhine. Striking image. I love the curve of the bridge leading your eye to the cathedral. Cologne is a beautiful place! Nice picture. Thx Vinay 😃 glad you liked it !